This bulky contraption is the first car the tiny French AGS team of Henri Julien fielded in F1, here seen on its debut appearance at the 1986 Italian GP. The JH21C didn't particularly work any miracles, even at the hands of the talented Ivan Capelli, who had just become the 1986 International F3000 champion. The car's poor form came as no surprise, though, since in fact it was a reworked Renault RE60. To make matters worse: stuck in the back was Carlo Chiti's brain child, the painfully unreliable Motori Moderni engine which ruined Minardi's debut season a year earlier and put Pierluigi Martini's F1 career on hold. For Capelli though, it meant a return to an F1 cockpit after two late-season Tyrrell appearances in 1985 netted him a surprised 4th in Adelaide. 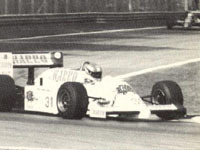 The following season Ivan had been untouchable in F3000, running away with the title in a Genoa March. To the delight of the little French outfit Capelli qualified the car twice on his two outings, a performance that didn't harm his reputation as a solid flyer. While AGS went on for another abysmal year with Pascal Fabre and a first design of their own, Ivan was welcomed at March, which made a second GP comeback with the backing of Japanese real-estate brokers Leyton House. It was the start of a hugely successful five-year relationship - in terms of giving the big guys a genuine scare once every while. The high-point certainly was the 1988 season when, come end of season, Capelli was mixing it with the front-runners. Ivan is still best remembered as the man leading the Portuguese GP before finally succumbing to Alain Prost. After a year with the troublesome CG891 - named after Cesare Garibaldi, the team manager who was lost to the team so early in his life - Capelli picked up where he left off, with a second at Ricard and losing third at Silverstone because of a broken fuel line. A character-building final year for Leyton House - in which team owner Akira Akagi was finally uncovered as a fraud - didn't hurt his chances when in 1992 a Ferrari drive came along. It was four years after the Old Man had died so they must have thought hiring a home boy wouldn't go against his rule - which incidentally Enzo broke himself in 1984 when he took on Michele Alboreto. Did the typical F92A ruin a potentially good thing or was it the highly political atmosphere in which Ivan could not survive? The fact is that Jean Alesi bravely soldiered on with the car and had some results to show for when the dust had cleared, while quiet family man Capelli simply drowned. Of course Ivan was no slouch but looking backwards one might come to the conclusion that Adrian Newey's first design perhaps flattered to deceive Capelli's true talents.